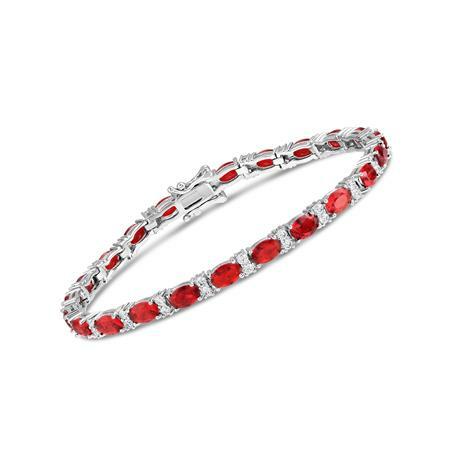 The classic tennis bracelet has stood the test of time, and when it comes out swinging in ruby red then you have a real winner on your wrist. Our signature DiamondAura® stones are the perfect canvas for delivering the look of fine rubies and diamonds. In fact our lab-created beauties serve up more fire and sparkle than mined rubies and diamonds for a fraction of the price. Our DiamondAura jewelry features all of the classic jeweler specifications, including color, clarity, cut and carat weight and is hard enough to cut glass. If you shopped on 5th Avenue, you’d find this bracelet priced for more than center court tickets at Wimbleton. We think overcharging for such a look is a racket, so we kept things sportsmanlike and gave this bracelet a price you’ll love.